If you love cats (and who doesn’t) and you love scary movies (okay, well maybe spoofs of scary movies), then this trailer is just for you! If you love cats (and who doesn’t) and you love scary movies (okay, well maybe spoofs of scary movies), then this trailer is just for you! 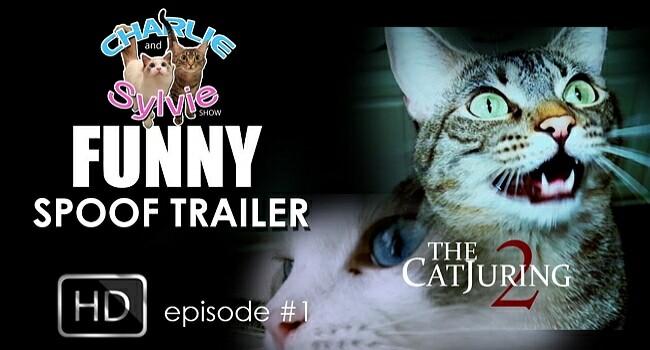 Join the Charlie and Sylvie show as they explore the ghostly possibilities in The Catjuring 2. So, grab some Swedish Fish, Goldfish Crackers, or whatever your favorite treat is and settle in for a short distraction. And, by the way, this is the perfect length to sneak a peak at the office with no on being the wiser you are watching cat videos, which, as a point of note, are good for you!